The Brewers Association reports it estimates sales of what it defines as craft breweries rose 12% by volume in 2007 and 16% in dollars. Craft brewers’ share of the beer category is 3.8% of production and 5.9% of retail sales. The BA estimates the actual dollar sales figures from craft brewers at more than $5.74 billion, up from $4.95 billion in 2006. 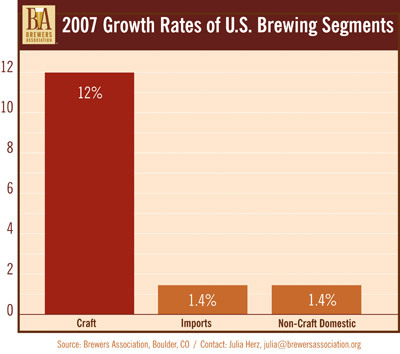 More craft beer statistics from the BA.